THE INDEPENDENT: Bad Grandpa: When Jackass was nominated for an Oscar... - ALTERIAN INC. In Bad Grandpa, the latest movie from the Jackass stable, an 86-year-old named Irving Zisman takes a kooky, cross-country road trip with his young grandson. Along the way, the pair shock, unnerve and offend a succession of unsuspecting bystanders, before making a subversive appearance at a child beauty pageant. So far, so Little Miss Sunshine. Yet what sets the former film apart from its influences is that the witnesses to its wacky set-pieces are not actors but real people, and Zisman is played not by a real eightysomething, but by Johnny Knoxville, who is 42. That his elderly disguise was so convincing explains why Jackass Presents: Bad Grandpa is this year’s most unlikely Oscar nominee, in the Make-up and Hairstyling category. Alterian’s HQ is a warehouse on a non-descript industrial estate in the unremarkable LA suburb of Irwindale. But hidden behind its beige facade is a workshop filled with weird creations coming to life, and an office decorated with previous on-screen triumphs: a dog in a full-body plaster cast from There’s Something About Mary; John Travolta’s female fat-suit from Hairspray; the titular robot from the sci-fi dramedy Robot & Frank. One memento sadly missing is a 14-foot replica of David Hasselhoff that the firm made for The SpongeBob SquarePants Movie – now being used as the base of a glass-top table at the Hoff’s home. Irving Zisman’s features were based in large part on Gardner’s grandfather, Fred. 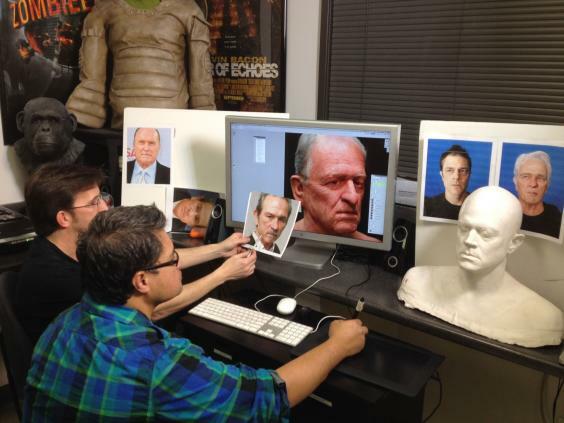 The face was made from silicone, paper-thin and translucent. The ears and the back of the head were latex. Then there was the wig, the eyebrows, the moustache, the dental veneers, and the liver-spotted backs of his hands. The team also made a wrinkled torso for Knoxville to wear in scenes where he removed his shirt, as well as some other anatomical items that it would be inappropriate to describe in the pages of a family newspaper. 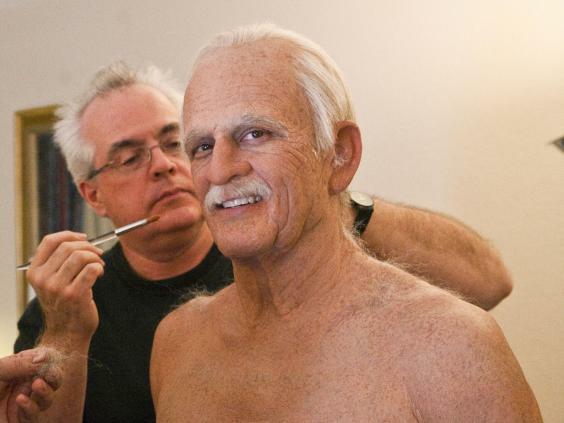 Each make-up element had to be mass-produced so that Knoxville could be disguised anew for every day of the 60-day shoot. Gardner, who is 50, grew up in Ohio but moved to California in the 1980s to study film at USC. Ostensibly as part of his studies, he engineered a meeting with legendary special-effects man Rick Baker, who offered him a four-week job as a production runner. “Four weeks turned into four years,” Gardner says. He subsequently worked with Baker on projects as varied as the music video for Michael Jackson’s Thriller and Gorillas in the Mist, and established his own company while working on the cult horror The Return of the Living Dead in 1985. Gardner worked on Jonze’s second film, Adaptation, and then Jonze introduced him to Guy-Manuel de Homem-Christo and Thomas Bangalter, better known as the enigmatic French dance duo Daft Punk. Alterian was instrumental in the design of the helmets worn by the band for their public appearances. Gardner and Bangalter bonded over a shared love for the 1950s sci-fi classic The Day the Earth Stood Still, and the helmets were influenced by the Gort, that movie’s alien robot. For the real-life survival drama 127 Hours, Alterian made the fake arm that James Franco sawed off using a blunt penknife. The prosthetic was so anatomically convincing that Gardner has started a side business creating life-like babies and combat wounds to help train emergency room doctors and army medics.